Directions: Take I-25 towards Santa Fe. Take US-285 N/US-84 N exit 282 to Santa Fe Plaza. Follow St. Francis Drive all the way through Santa Fe and it will eventually turn into US-285 N/US-84 N. Continue about 60 miles until you reach the town of Tierra Amarilla. Take NM 112. 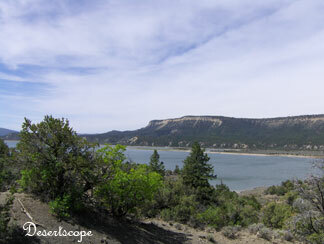 It will take you all the way down to El Vado Lake State Park. 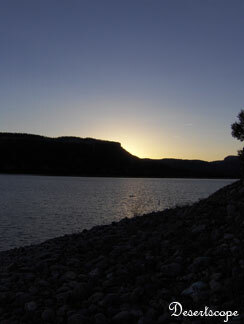 Nestled in the mountains near Tierra Amarilla, El Vado Lake State Park offers New Mexicans and Texans a pleasant summer retreat. Since the elevation is about 7000 feet, the air is always cool and breezy here. The lake is more than 3000 acres. It is an ideal place for fishing and boating. Overcome by the early summer heat, we decided to spend our Memorial weekend there. Following a somewhat arduous path, we finally arrived at El Vado Lake State Park in the late afternoon. Once we turned at Tierra Amarilla, the scene changed a bit around us. NM 112 was surrounded by pine trees. As we approached the park, a large adult turkey flew right in front of our car. Terrified by the approaching object with tremendous speed, the turkey flapped its heavily feathered wings laboriously to clear the path. I had never seen a wild turkey before, let alone one in flight. It was amazing to see such a creature living in the wild. A little bit down the road, a tiny squirrel darted across the path. Once we arrived at the camp site, we rushed to set up camp. The camp site is well established. It comes with a shelter, two tables and several benches. Within a short walking distance, there was a children’s playground and a restroom that included private shower stalls. Because it has been so dry recently, no open fires were allowed. We had to resort to sandwiches. As the late afternoon sun started to descend towards the surrounding mountains, we walked along the rocky beach and took some time to examine the colorful rocks. Along with the scents of mountain pine and cool fresh water, the gentle waves lapping at the shore carried us off to sleep. 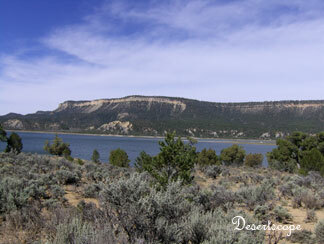 Following the Rio Chama scenic trail, we walked towards Heron Lake. The trail was surrounded by thick pine forest. Pinon trees were scattered among the taller pine trees. Unfortunately, it was not the season for pinons. We could only locate a few fallen nuts on the ground (the ones the squirrels instinctively knew were empty). As we approached the top of the mountain, we could see El Vado Lake below shine with a dark green color. On reaching the top of the highest peak along the trail, we were confronted with a problem. Unaware that the trail was actually more than 5 miles one way, we found that we hadn’t brought enough water for the whole trip. We were forced to turn back before we seeing the swinging iron bridge. The return trip proved quite a bit easier. Once we were half way back, our eyes were captured by the beauty of El Vado Lake. Down the foot of the mountain, a small curved of beach, sheltered by green trees, gleamed under the sun. Unable to resist the urge, we walked off the path, off the slopping mountain ridge, and finally arrived at the sandy beach. The area was secluded. Standing on the soft sandy ground, we felt as if we were a group of explorers that has landed on an island upon which no other people had ever walked. Along the water front, tracks from deer, elk, bobcat (big for a bobcat, maybe it was a young mountain lion) and other creatures large and small showed clearly on the muddy ground. Then we came across some unusual boulders. Upon closer inspection, we found they were volcanic bombs with crystal fillings. Later we found that type of rock were called septarian concretion. Some of them were about size of table while some were fist sized. Like strange monuments, they seemed to guard the sandy beach against unwelcome visitors. The trip had taken us much longer than expected, but it was very enjoyable. The night grew much colder the next day as the wind picked up a bit. Our small tents rocked, bent and twisted in the violet wind. Sleep became difficult as the wind seemed to grow in strength. The flapping of our tents would occasionally cause us to wake with a start. My husband took my four year old fishing as soon as we were up. The water moved much faster than the previous day. The little one made a few attempts as he busily reeled in the line as soon as it was in the water. I guess a four year old just don’t have the patience required for fishing. When we returned for lunch, he was anxious to don his life vest. We pulled out our inflatable raft and filled it with air next to the lake. As soon as he touched the spongy boat bottom, however, his enthusiasm was replaced with fear. He jumped out of the boat. With much convincing, he finally returned to it. As my husband battled fiercely against the wind and waves, the tiny boat rocked and rowed in water. My small boy’s face was pale and tense. We found a length of rope and anchored the boat to the side of the beach. This seemed to relax him more. Before long, he was ready for another trip away from shore. As I watched, my little guy rowed as hard as he could, along with my husband, they drifted away from the beach and headed downwind. They spent the better part of an hour rowing nearly into the wind just to avoid beaching their tiny craft. They went ashore a few hundred yards downwind and deflated their boat. They hiked back to the campsite, arriving just as the rest of us were finishing with the packing. We left El Vado Lake sometime after 4:00pm.